"Segregation has been and will continue to be a tool that is necessary to manage legitimate safety concerns. Reforms in the use of this practice will only be successful if the safety of inmates and staff is maintained or improved in the process. 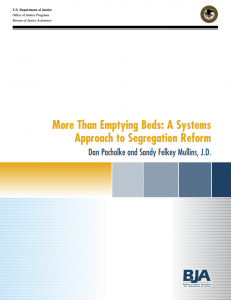 To impact the health and well-being of people under correctional control, reducing the use of segregation on its own by only “emptying beds” is of limited value. To make an impactful change, a systems approach to this complex issue is essential. This policy brief shares lessons from the systems approach to reform undertaken by the Washington Department of Corrections (WADOC) that began more than a decade ago and continues to the present day" (p. 3-4).